Here’s a quick reference to the types of bathroom tiles to consider. They are not limited to your bathroom interior design but are selected due to their durability, non-slip and aesthetic quality. In general, tiles come in two forms: rectified and chamfered. Rectified tiles are cut at right angle while chamfered ones have round edges. To minimize the use of grout or large gaps between each tile, opt for the rectified ones. Always leave a minimum of 2 mm between each tile to ensure evenness. With a little creativity, you can also use them as flooring materials for other parts of the house. Ceramic: Most commonly used, and easy to maintain. They come in gloss and matt finishes as well as ceramic- / porcelain-backed. Available in different patterns and colors, and in various sizes. Some recent designs show embossed tiles in myriad textures and available in different shapes, colors, and sizes. Ceramic bathroom tiles cover the walls and basin, adding a sleek, contemporary touch. Note the shelf holding frames and decorative items like elephant statues. They show up well against the white contrasting background. Homogenous: These tiles are easy to maintain. Their homogenous nature (front, sides and back are in same color tone) means the edge or thickness is in the same color. Almost scratch-resistant, they come in matt or polished finishes. Prices tend to be higher for polished finishes. Granite: Durable and toughest among the different types of tiles. Almost scratch-resistant, it comes with a consistent tone. Designers and architects usually choose dark or dull-tone tiles for commercial premises. The most affordable ones come from China. Other Stones: Limestone and sandstone are beautiful, but they are porous and prone to stains as they are difficult to maintain. Most commonly featured in tropical- or resort-inspired interiors. 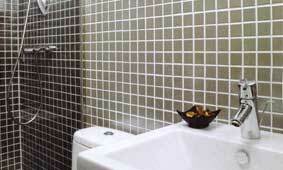 Ceramic and Glass-mosaics: These can complement retro-inspired interiors and are easy to maintain. They are also available in primary and secondary colors. Be it square or hexagonal, they bring dazzling eye candy, especially for curved surfaces. They’re also the best choice for steps, hard angles and curbs as there are no sharp edges that can cause injuries. 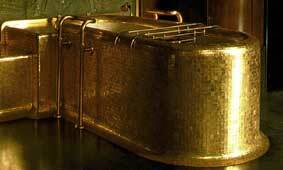 The bathtub below is given the royal treatment with gold mosaics covering all curved surfaces. This is complemented with gilded faucets and handrail while the floor is in sanded marble. Stainless Steel Mosaics: New and still relatively uncommon in the market, they are suitable for very modern and stark interiors. Other than square, shapes include hexagon and diamond. Finishes come in stainless steel hairline, stainless steel mirror, stainless steel etched or gold color. The tiny bathroom below is finished with stark, metallic mosaics which embellish the walls while also making it easy to clean. Enameled Porcelain: This is also relatively new. It gives your bathroom a sleek, metallic sheen as they look exactly like steel plates, complete with screws. They will not oxidize or rust, unlike the real thing. However, avoid using them on the floor as the metallic glaze can be slippery when wet. Pick the European made ones over those from Asia as they are better in quality. Buying different-sized tiles may cause problems during installation, especially when it is a huge area being tiles. 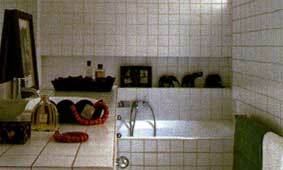 There could be gaps between the tiles which can be unsightly. For granite and other stones, accept the differences in color and tonality as these contribute to the uniqueness. Water seeping into the gaps between tiles can cause stains. If you are re-tiling, grab a grout sealant (from DIY shops) and apply it over the gaps. If you cannot re-tile, a grout colorant can do wonders. Get one that complements or contrasts your tiles’ colors and paint over the stains. Then apply the grout sealant to make subsequent maintenance a breeze. If you want to make cleaning less of a chore, replace tiles with smooth quartz base finishes; there would be no more grout lines or dirt and algae to scrub off. Once you’ve installed the bathroom tiles, maintaining them should be a breeze. Most household detergents will do the job. If marble tiles are used in wet areas, their color tone and shine may diminish over time. However, they can be re-polished by a tile specialist to bring back their luster. Click here to return to the top of Bathroom tiles.